Spending Review 2015: we want your reactions! This week, the government announced the outcome of the 2015 Spending Review exercise. The science budget was frozen in real terms, and we want to know what you think. Firstly, we’d like to say an enormous thank you to everyone who attended our rally (in person or online) or submitted a postcard to George Osborne as part of our recent campaign. 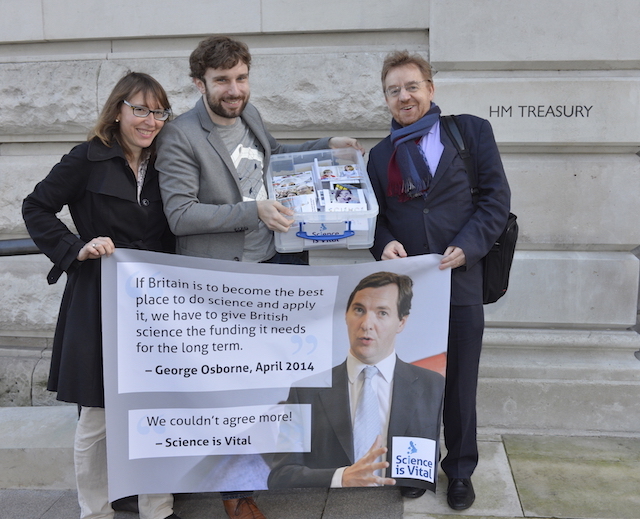 On Wednesday last week, we delivered your 1600 postcards to the Treasury, all with one overriding message: science is vital. On Wednesday, the Chancellor announced the outcome of the 2015 Spending Review, with the news that the research budget was frozen in real terms through to 2020. This appears better than the outcome in 2010, when the budget was frozen in cash terms only and was subject to erosion by inflation. It is undoubtedly due in no small part to the passionate response of our supporters – alongside all the other groups who made strong representations to the government about the importance of science – that we secured this outcome. While this is a relief compared to the cuts that were feared, in our view the settlement still falls well short of the robust investment in science that we really need to stay competitive internationally and to keep the economy growing. We feel the government has a chance to repair the damage caused by the flat cash decline of the past five years, but it has decided not to. None of the details have yet been released, which means that the definition of the ‘science budget’ might be expanded, thereby diluting the whole. Even with no dilution, we will still be 20% worse off in 2020 as a percentage of GDP than before the last Spending Review in 2010. Whatever your connection to science and research, we want to know your reaction to yesterday’s announcement. Leave a comment below, or email jenny@scienceisvital.org.uk, to let us know what you think. We aim to publish a selection of the responses, but please let us know if you don’t want your contribution not to be included or if you prefer not to be named. 2 Responses to Spending Review 2015: we want your reactions! As David Willets once said on question time. The UK should really have the Science Budget of Norway but we excel and over achieve at Science so we a larger budget. In the Sunday Times Business section of the 15/11/2015. The Secretary of State for Business Skills and Innovation was looking to translate grants from Innovate UK into repayable loans !! If you look at how much money investors have made from Biotechnology in the last 3-5 years you would say it was the best area of industry to invest in. Check out International Biotechnology Investment trust and Axa Framlington Biotechnology Unit Trust. This money has been largely made by backing Small US Biotech Companies. So the model for a successful Biotech industry exists which can only evolve from basic research. As we are so good at Science why have we not got a hugely successful Biotech Industry in this country. It can only be down to government sentiment. we are grasping at straws if we say that a fixed budget in “real terms” is better then a fixed budget in “cash terms”. Both are disastrous. One branch of science is about pure research, and any new discovery can be seen as a bonus which can help industry make profits. That is good for the economy, and indirectly benefits all of us, but no one will die if it does not happen. The other side of science is more applied, and is about how we deal with real problems and current emergencies. People do die if that does not happen. It is obvious that closed medical research projects may harm people, but in the face of climate change, Climate Science , Earth sciences, Hydrography and Agricultural Science, among others become vital to the safety of the electorate. For 25 years (from 1975 to 2000) I worked in Agricultural Research, and during a time of mainly “pegged budgets” we lost 8 complete research institutes within the Agricultural Research Council, and then the Council itself was lost within the Agriculture and Food Research Council. By the time I left (due to yet another call for voluntary redundancies – moral was sinking yet again) The Agriculture and Food Research Council had already been absorbed into The Biology and Biotechnology Research Council. But when I started, one of Britain’s biggest export earners (or so Ministers boasted) was the Artificial Pyrethroid Insecticides which had been developed by my new colleagues. A few years later our local paper boasted about some of my colleagues winning the European Anti-Pollution Award, on the day that they were all sacked in order to redistribute funds as our budget had been pegged. About the same time a rising young Post Doctoral Researcher with a golden future in agricultural Research left to manage a book shop. And now we have pegged budgets again! In agriculture we have new plant and animal diseases spreading north due to climate change. Blue Tongue and Schmelnberg virus spread across the whole of the UK in less that a year, and pegged budgets will put the scientists, who have to identify, monitor and find a “cure” for similar diseases under threat of redundancy. In forestry the situation is even worse with Ash and Larch, for example under threat of extinction in this country due to newly imported diseases. And Ash, in particular is one of the species that forms the backbone of many shelter belts which have been planted to protect us from the worst f climate change induced storms.